Jaxx Beanbags are proudly made in the USA, in Atlanta Georgia. 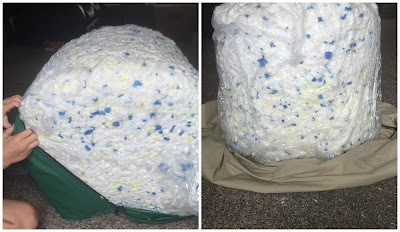 We have been eyeing a beanbag for a long time, but never pulled the trigger because with 3 kids and 2 cats I was afraid it just wouldn't hold up. Never owning one before we weren't sure of the durability they upheld. 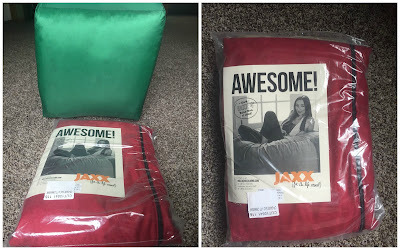 So I was excited to be contacted y Jaxx and review a kids beanbag. I gave them 2 I was interested in as my options, both were 4', the lounger and cocoon. 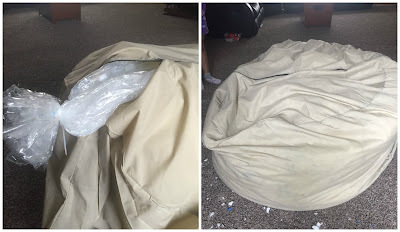 I got a different 4' beanbag and it's not on their website, so I'm guessing overstock. It is an adult beanbag, but everybody in the family can enjoy it, due to its generous size. As you can see above, the 'beans' (foam) comes in a compressed cube, this cube comes pretty tiny, although heavy, and it's hard to imagine this will be a 4' beanbag. You unzip the cube and pull the outer vinyl covering off, this is a chore for sure as it's packed in SO tight. Once you do, lay it in the inner cover of the beanbag. Zip up this cover halfway, and then untie the inner bag and loosen up all the foam. Really get in there with your hands/arms. It takes Oxygen to make it expand so you need to allow air to get in there. Then zip up the inner layer and break off the zipper (making it really hard for little hands to open), if you need to open it at a later date, you can use a paperclip. Then put it inside the outer cover and let expand for at least 6 hours. It will continuously expand over 24 hours, but most of it happens in the first 6. Keep fluffing and moving it around for these 6 hours so air hits every piece of foam! This was IMMEDIATELY after putting on the outer cover. My daughter is 9, it's pretty large! And after about 5 hours (my kids are impatient) they had to explore it! It's perfect for 1, all 3 and even the cat enjoys it! I love the lay in the beanbag and watch movies. It's perfect for curling up under a blanket and enjoying some time. I love that the outer cover can be removed and is machine washable. Perfect for my kids, they've already gotten some food particles on it! We've had this beanbag almost a month already and the kids are still obsessed with it. Right now they are piled up on it (all 3 of them) and having a blast. Overall: ***** hands down!!! Would buy another one any day, and we might even replace our couch with a larger one, one day! In comparison to a regular couch, they are cheaper. A 7' giant is $349 on their website!